Pokémon GO is the latest rage, and suddenly kids (of all ages) are everywhere trying to collect Pokémon. This new app inspires players to walk miles in search of virtual critters, exploring their surroundings. However, a surprising number of obsessed people are taking their adventures a little too far. Seem obvious? Apparently not, according to numerous reports of people playing in these no-no locations! So, where should you put away your phone, silence your push notifications and NOT try to catch them all? This may seem like common sense, but Pokémon GO players are darting in front of cars in record numbers. Enthralled by their virtual safaris, players are wandering into traffic, oblivious to oncoming cars. Even worse are the reports of people actually driving while trying to grab a Poké. Nope. Nope. Nope. If you are on foot, just harken back to kindergarten and remember to look before you cross. Is one person's memorial another's Pokéstop? Apparently so. While it may seem like it should go without saying... both the Holocaust Museum in Washington, D.C. and the Arlington National cemetery have asked people to stop collecting Pokémon on their sites. If you are somewhere that demands serious respect or is filled with somber or grieving people, it is probably not an appropriate place for tossing your Pokéball. Whether you are pulled over by a police officer, facing a security guard or just sitting in the principal's office, our advice is NOT to try to level up until you are free and clear. Seriously, as cool as your Charmander might be, it is not going to impress your arresting officer. Similarly, we recommend just staying out of police and fire stations, prisons, utility substations and secure government facilities. Apparently a lot of Pokéstops are in churches, since those are generally deemed safe locations. However, while it might be ok to nab an Abra during vacation bible camp, it is not appropriate to catch a Spearow during mass, a baptism and definitely not during a funeral. Amen. While most people know better than to go into dark alleys and other unsafe or creepy places... the temptation to follow a Jigglypuff is apparently enough to send some people into less than savory locations. 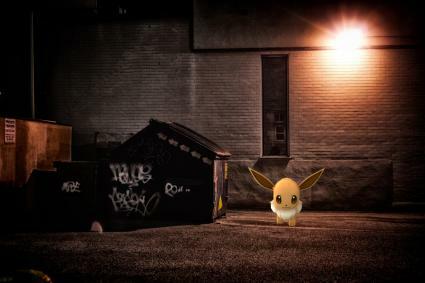 There have already been reports of robberies of Pokémon GO players lured to specific locations. Also, it is best played with friends even if you all are staring at your screens most of the time. Avoid dark forests, alleyways, desolate deserts and gothic mansions to name a few. Tip: If you'd be yelling at the heroine in a horror flick not to go there -- don't Pokégo there! Some Pokémon are water dwellers, but that doesn't mean you and your phone need to venture into the water. As you run after your prey, watch out for pools, ponds, streams and marshes. Falling into these can be detrimental to your health as well as that of your mobile device. While you're at it, try to avoid cliffs, deep holes, quicksand and volcanoes. Just because there is a Pokémon hiding inside does not give you license to barge in on someone in a private place... This means occupied bathrooms, dressing rooms and confessionals are all off-limits to you when you're on the hunt. 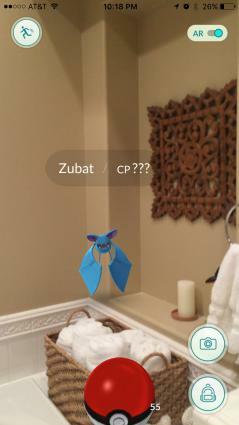 Just because there is a Wurmple in the shower with your sister, it doesn't mean she wants more company in there. So, go ahead and start catching your Pokés, but make sure you don't do it at risk to your life, limb and self-respect!